CosmoBC.com » AstroBlog » Space Exploration » What’s on the Menu for Astronauts? What’s on the Menu for Astronauts? When you think of eating food in space, what foods come to mind? Chances are, it’s that freeze-dried ice cream that you tried once as a kid during a science field trip, right? During the early part of the space race, that would have been a staple, but astronaut food doesn’t look like that anymore. What is on the menu for modern astronauts, and how has it changed since we first started setting out into the cosmos? During the early years of manned space flight, the food that the astronauts were able to take into space with them greatly resembled the tube of toothpaste on your bathroom counter. It had the consistency of baby food but was packed full of all the nutrients and vitamins the astronauts needed to stay healthy in space. That doesn’t mean they enjoyed eating it though. During the Apollo missions in the late 1960s and early 1970s, NASA engineers introduced a new kind of space food — the freeze-dried meals you know and love. Astronauts could rehydrate these foods with a specialized water gun, making them ready to eat in a few minutes. This option also increased the variety of food that astronauts could take to space with them. It wasn’t until the late 1970s that NASA came up with a space-safe TV dinner. Around this time, refrigerators started getting installed on Skylab and subsequent space stations to enable the astronauts to store and enjoy things like fresh fruits and vegetables. So what does a modern astronaut menu look like? That really depends on the time of year, but the current menu looks a lot like what you’re making at home. Scrambled eggs and oatmeal for breakfast, spaghetti and chicken teriyaki with broccoli for dinner. Around Thanksgiving, for astronauts that are in space during the holiday, dinner includes turkey, stuffing, candied yams — everything that you’d expect to find at a home-cooked Thanksgiving dinner. The trick is to develop foods that taste good after being freeze-dried and rehydrated. It can take months to develop a good recipe before it’s finally mass produced and taken into orbit. One problem, even with these multi-course holiday meals, is that you can’t load up your plate and feast — you have to eat one item at a time, or the rest of your meal will float away while you’re trying to enjoy it. That might be a downside if you like eating your turkey, stuffing, mashed potatoes and cranberry sauce all in one bite, but it’s still pretty cool that the astronauts get to enjoy holiday dinner even though they’re thousands of miles away from home. If you’ve ever wondered what modern space food tastes like, here’s a fun experiment for you. Make your own space pudding! Start with your favorite flavor of instant pudding mix. You’ll also need powdered milk, water and a container to mix it in. If you want to make these for a group, you’ll need individual zip lock bags. Mix equal parts pudding mix and powdered milk, then add water according to the pudding’s directions. Mix it together, and you’ve got your very own space pudding! The powdered milk makes it a little thicker than standard instant pudding, which is similar to the kind of food that the astronauts will be enjoying on the International Space Station. We can shuttle fresh fruits and vegetables up to the International Space Station on things like SpaceX’s Dragon capsule, but even when refrigerated, these fruits and vegetables don’t last more than a couple of weeks. So why not have astronauts grow their own food? Most science fiction spaceships have a hydroponics department where fresh food can be grown. This area doubles as an oxygen producer, which can be invaluable for deep space voyages. In 2015, members of Expedition 44 on the International Space Station were able to enjoy leafy greens that were grown in microgravity aboard the station for the first time. They used LEDs to provide the light wavelengths needed for the plant growth. While some fruits and vegetables won’t grow well in space — like those that grow on trees, such as apples — anything that can grow in a hydroponics greenhouse on Earth may be able to grow in microgravity, on ships with artificial gravity (which we haven’t figured out yet) or even on colonies like those that we’re planning to make on Mars. NASA hasn’t totally abandoned freeze dried foods — they just don’t taste as good as the real thing. The recipes that are currently being developed might even follow us to Mars when the first astronauts set foot on the Red Planet sometime in the next decade or so. Who knows — maybe we’ll even develop tastier space food for the future Martians that we can’t even imagine yet. For now, though, freeze-dried ice cream and space pudding sound pretty good to us! 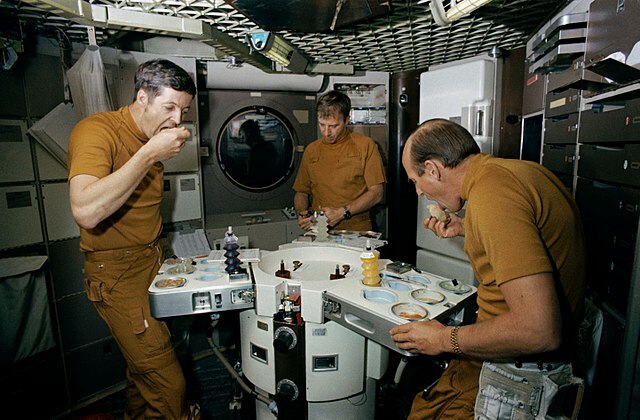 Photo by NASA of Skylab 2 astronauts eating space food in wardroom of Skylab trainer. Why Does the Advisory Committee Want a Smaller ISS Crew?